One builder, Harry Phillips, shaped the northwest edge of the Alameda Park addition, building 21 homes within a three-block area between 1924-1928. Many of Phillips’ trademark Tudor-influenced homes were designed to capture classic city views as they straddle the Alameda Ridge on NE Ridgewood, Gile Terrace and Edgehill Drive. Phillips also built an undetermined number of homes throughout Portland’s West Hills as well as several prominent and high-design gas stations. Harry Phillips built just about every house you can see in this contemporary view, looking north from NE Ridgewood at about NE 24th. Phillips was born April 16, 1886 in Cleveland, Ohio, the son of Irish and English immigrants. His father, Harry Phillips, Sr., was a machinist for the railroad, and when an opportunity came up in the early 1900s for a company-paid relocation from Cleveland to Portland, and a special price on a home in the Sellwood area, the family jumped at it. Phillips found his natural talent for the homebuilding business in 1916 when he built a home in the Sellwood area for his future brother-in-law Harry Johnson. 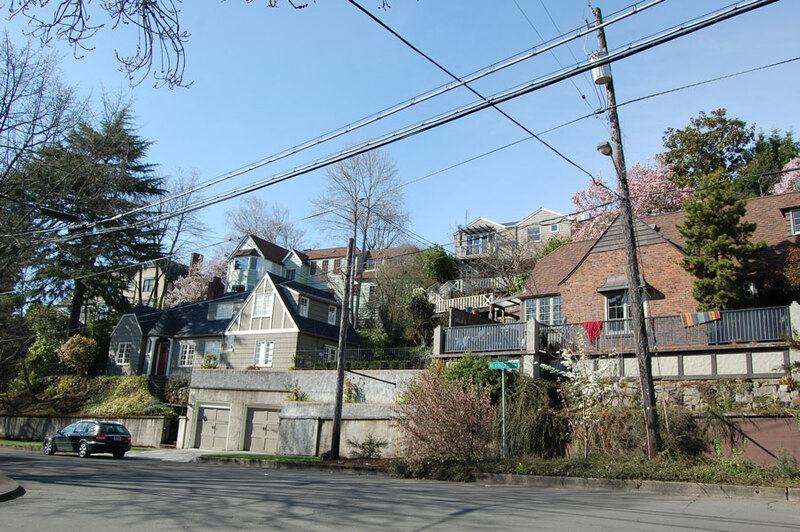 A series of homes followed in the Lair Hill neighborhood of Southwest Portland. Phillips’ son Jerry (Henry G. Phillips), now in his late 80s and living in California, remembers how those first homebuilding projects set the stage for the future. Phillips’ first project in the neighborhood was a modest bungalow built on Northeast 28th, six blocks north of the Alameda Ridge. But a few years later, he was working with more ambitious designs drawn by Portland architect George M. Wolff (an early founder of today’s ZGF Partnership), and working on ambitious hillside sites. The Gile Addition was platted in 1921, and by 1923, Phillips and Wolff were busy. Most of the houses perched on the Alameda Ridge between Gile Terrace (at the top) and Ridgewood (at the bottom) were built by Phillips. By then Phillips, his wife Dorothy, and his young family had moved to Alameda, and were living in the home he built at 2414 NE Ridgewood. The second Phillips son, Roger, was born in that house in 1924. By 1925, the time-tested build-sell-move process was underway again and the family was on the move into a new house. But this one was special. The house at the top of the hill is the prominent home at 2624 NE Alameda, located at the upper end of the intersection between NE Stuart Drive, Alameda and NE 26th. The two-storey house with daylight basement has commanding views to the south, and appears to float above the Alameda Ridge as NE Stuart Drive drops off down the hill. As a boy always ready for adventure, Jerry remembers prowling the unfinished homes his dad was building along the ridge, often on the lookout for lead because it made great ammunition for slingshots. The lead came in sheet form and was used in flashings and to create exposed roof valleys. There were always left-over chunks which the kids would shape into pellets. Roger Phillips, now 85, remembers proudly riding along with his dad to the job sites, and watching as his father worked with his crew. Both boys recalled plenty of shenanigans back and forth through the vacant lots and under- construction homes along the Alameda Ridge, including grass fires in vacant lots, and stern scoldings from firemen. Both boys, and their older sister Betty Lou, attended Alameda School. Life was good. Phillips’ homes here in Alameda were built on speculation from 1926-1928, and they all sold. But the crash of 1929 and the following years of the Great Depression changed everything. In 1929, Phillips was underway with up to a dozen homes in Portland Heights and the Westover area, built on speculation and financed by an investor friend who was also an Alameda neighbor. The financial crisis put incredible pressure on Phillips, who was completely leveraged to fund construction of the homes, which weren’t selling. Son Roger remembers his father’s health beginning to fail. On April 16, 1935, Harry Phillips, age 47, died from a hemorrhaging ulcer. The family was crushed: Betty Lou was 16; Jerry was 13; Roger was 10. In short order, it became clear the family would lose the house at the top of the hill to cover the construction debts. Roger remembers the banker friend breaking the news to his mother about the foreclosure. Dorothy and her children moved to the boarding house at 2424 NW Lovejoy, which Dorothy soon took over as manager. The brothers remember earning a few cents by doing odd jobs and errands for the lodgers. Workers from Harry’s construction crew helped refurbish the house as the family struggled to make a living. No one was prepared for the double blow of tragedy: Dorothy was killed in a car accident the next year. Betty Lou married young and moved down the Willamette Valley. The boys were taken in by their uncle Harry Johnson, finished their schooling, served honorably in World War II, and went on to productive and successful lives. Despite the tragic series of events, Roger and Jerry have fond memories of their time in the neighborhood, and are proud of the legacy left by their father, Harry Phillips. And whenever they’re back in Portland, they always drive by the house on the hill. Thanks for your presentation on Alameda Park this AM, Doug. We spoke about your meeting Laura McGoldrich who owns the run-down blue and white 1910 house on 29th & Mason. She is quite reclusive but we chat now and then. I doubt she’ll invite you into her home but she might accompany me over to your house if we arrange a meeting time. Let me talk to her and I’ll contact you. BTW, my father was a Portland architect: Neil Kochendoerfer of Edmundson, Kochendoerfer and Kennedy. They did schools, churches and hospitals. Harry Phillips was my grandfather. My dad, Jerry, died this past August. Going through Dad’s papers, I came across a sketch of a building Harry may have built, or just planned to build. He was quite a draftsman and I can see where my father inherited his artistic ability. I also found two sketches Dad did of the 2624 NE Alameda St. house. I also found several old photographs of art deco gas stations, but no indication that they were actually built (designed?) by Harry, but I suspect they were. I have spent several enjoyable hours this weekend searching for the houses you listed as Harry’s on Google Maps. I think the street numbers have changed a bit, and Google Maps isn’t always accurate, but I had a real sense of his style. The last time I was in Portland was in 1961. I was eleven. We were leaving Ft. Lewis, WA to see my mother’s mother in California. We stopped by the “old neighborhood” so Dad could show his daughters where he was raised. I suspect it was the Alameda St. house, though I can’t say for sure. We were raised on stories of what a rascal he had been back in the day. At that time, my father was a captain in the Army, and I had never seen him be anything other than a straight arrow. That day, however, I knew all his childhood stories were true. Dad noticed an old woman gardening in the house next door. He got out of the car and approached her, saying, “Hi ,Mrs. _______! I bet you don’t remember me.” She turned slowly, looked him up and down, and said, “Yes, I do. You’re that nasty Phillips boy!” I don’t believe I have ever, before or since, seen my father embarrassed. Needless to say, I refused to let Dad tell these stories to my three boys until they were adults. They had enough ideas of their own! I have lived in New York state for almost forty years, but I look forward to going to Portland someday and seeing the houses my grandfather built. If you find out any more about them, I would love to hear from you. Thank you so much for the time you have taken to research the history of this wonderful area. I never knew either of Dad’s parents and you have enriched my life by giving a better sense of who my grandfather was. Thank you Kathryn. I appreciate the story that you have shared. I’ve written you a message direct to your e-mail. I would be very pleased to host you on a guided walk among the Harry Phillips home. Please let me know when you come to Portland. Thank You for this well presented and detailed report on Harry Phillips’ homes and history. Harry was my Grandfather through his daughter Betty Lou Phillips Johns. In 1986 I took my mother on a driving tour of the Alameda Homes where she enjoyed telling stories of here family life. After retirement I returned to Oregon and have visited the neighborhood to photograph Harry Phillips’ work. Mother told me that her Uncle was an Artist in wroth iorn and produced an archway design for the stucko at 2624 NE Alameda. I would be interested in knowing if this work is still present in the house. Thank you, Doug, for sharing Mr. Phillip’s story, and his family’s story. I live at 3512 NE Fremont, in the flat with the arches on the Fremont side. I’m completely in love with my new home! Thank you for emailing me this fascinating link. I plan to do a walking tour of his other homes as I walk my dogs in the neighborhood.